Sie sind momentan im Blogarchiv für Dezember 2008 von gizmeo.eu | inside the machine. 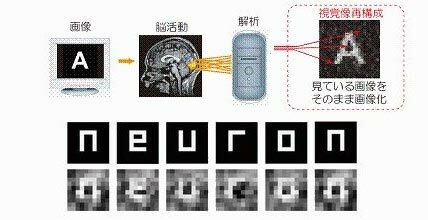 die ATR computational neuroscience laboratories aus japan haben das wohl interessanteste biologische gerät gehackt: das gehirn. zusammenfassend heisst das, sie konnten bilder, die einem proband vorher auf einem computer-monitor gezeigt wurden, wieder rekonstruieren und zwar anhand messungen des blutflusses im gehirn bzw. dessen aktivität. die tests werden noch diesen monat in der wissenschafts-zeitschrift neuron abgedruckt. hier zwei links zum englischen original-artikel: via register hardware und via pink tentacle. „…Dr. F. Krueger at ATR says that they think the tech could someday be used to hack into people’s dreams“. w00t! dann wären wir voll in der anime-fantasie-welt von paprika! „…observed one of my students with a group of other children gathered around his laptop. Upon looking at his computer, I saw he was giving a demonstration of some sort. The student was showing the ability of the laptop and handing out Linux disks. After confiscating the disks I called a confrence with the student and that is how I came to discover you and your organization. Mr. Starks, I am sure you strongly believe in what you are doing but I cannot either support your efforts or allow them to happen in my classroom. At this point, I am not sure what you are doing is legal. No software is free and spreading that misconception is harmful. These children look up to adults for guidance and discipline. I will research this as time allows and I want to assure you, if you are doing anything illegal, I will pursue charges as the law allows. Mr. Starks, I along with many others tried Linux during college and I assure you, the claims you make are grossly over-stated and hinge on falsehoods. I admire your attempts in getting computers in the hands of disadvantaged people but putting linux on these machines is holding our kids back. an alle linuxer: kauft euch endlich legales micro$oft! ihr immer mit eurem illegalen scheiss! harhar. nachwuchs-piraten und piraten-veteranen aufgemerkt: es gibt anscheinend eine firefox-erweiterung namens pirates of the amazon, die beim stöbern auf den amazon-produktseiten einen direkten link zur torrent-datei der pirate bay-torrent-seite anbietet. harhar. taucht z.b. eine dvd dort auf, erscheint ein link download 4 free und man kann seinen torrent-client (z.b. azureus) direkt mit dem seed füttern. harhar. [via] leider ist die seite, wo die erweiterung erhältlich war, unerklärlicherweise offline. und ganz bestimmt steckt nicht amazon dahinter. vielleicht war das doch ein stück zu legal. doh. dann eben wieder ab in den golf von aden, echte piraten-sachen machen. harhar. „in general relativity, the future light cone is the boundary of the causal future of a point and the past light cone is the boundary of its causal past.“ [wikipedia.org] This feed lists the stars in your personal light cone. Chi Draconis is 26.3 light years away and only 3 weeks from the outer surface of your light cone – your ever-growing sphere of potential causality – which began its expansion from Earth on your birthday. Pi-3 Orionis is 26.2 light years from Earth. It was enveloped by your light cone 2 weeks ago. Alpha Lyrae is 25.3 light years away. Alpha Piscis Austrini is 25.1 light years away. HR8721 is 24.9 light years away. Mu Cassiopeiae is 24.6 light years away. Beta Hydri is 24.4 light years away. 107 Piscium is 24.4 light years away. HR222 is 24.3 light years away. HR6426 is 23.6 light years away. HR753 is 23.5 light years away. Xi Bootis is 21.9 light years away. HR8832 is 21.3 light years away. Delta Pavonis is 19.9 light years away. 82 Eridani is 19.8 light years away. HR7703 is 19.7 light years away. 36 Ophiuchi is 19.5 light years away. Eta Cassiopeiae is 19.4 light years away. HR5568 is 19.3 light years away. Sigma Draconis is 18.8 light years away. Alpha Aquilae is 16.8 light years away. 70 Ophiuchi is 16.6 light years away. Omicron-2 Eridani is 16.4 light years away. Tau Ceti is 11.9 light years away. Epsilon Indi is 11.8 light years away. 61 Cygni is 11.4 light years away. Alpha Canis Minoris is 11.4 light years away. Epsilon Eridani is 10.5 light years away. Alpha Canis Majoris is 8.6 light years away. Alpha Centauri is 4.4 light years away. The Sun is right here. calculate your own light cone: http://interconnected.org/home/more/lightcone/.